These are the Xeneplex ingredients that compromise each Xeneplex suppository: Organic Coffee Extract 200mg, Glutathione 200mg, Magnesium Di-Potassium EDTA 50mg, Cocoa Butter. Glutathione – As a tripeptide Glutathione contains an unusual peptide linkage between the amine group of cysteine and the carboxyl group of the glutamate side chain. Glutathione, an antioxidant, protects cells from toxins such as free radicals. Thiol groups are kept in a reduced state at a concentration of approximately ~5 mM in animal cells. In effect, glutathione reduces any disulfide bond formed within cytoplasmic proteins to cysteines by acting as an electron donor. In the process, glutathione is converted to its oxidized form glutathione disulfide (GSSG). Glutathione is found almost exclusively in its reduced form, since the enzyme that reverts it from its oxidized form, glutathione reductase, is constitutively active and inducible upon oxidative stress. In fact, the ratio of reduced glutathione to oxidized glutathione within cells is often used scientifically as a measure of cellular toxicity. 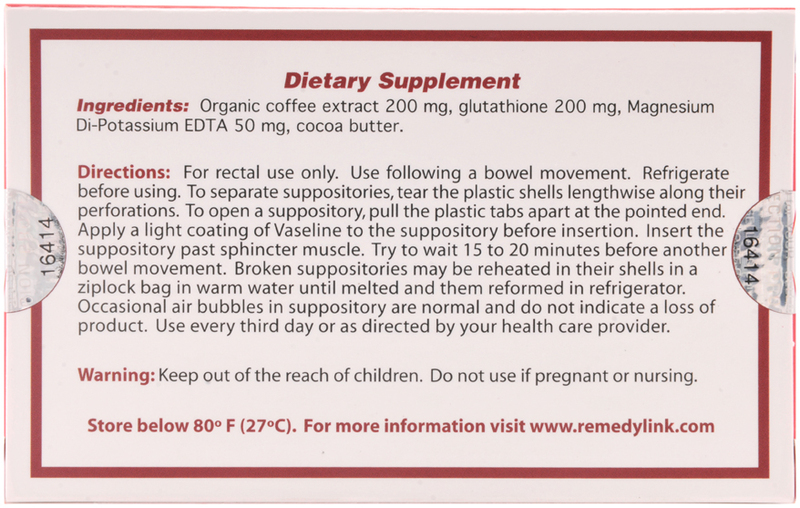 Magnesium DiPostassium EDTA – Magnesium D-Potassium EDTA is used in Mericardium for suppository chelation. It is safe for adults who may be on a sodium-restricted diet, and for those who use calcium channel blockers, since it is calcium free. It is recommended that all users take a calcium supplement 12 after hours taking Mericardium since Magnesium Di-Potassium EDTA can help mobilize dystrophic calcium from the body soft tissues. Mericardium is safe and effective when used by young people whose veins are not developed enough for intravenous therapies.